Thidwick is a big-hearted moose with a big head full of problems! Thidwick The Big-Hearted Moose makes a great transition from print to digital, with top-notch features from Oceanhouse Media. Enhancements are primarily educational and focused on word recognition. 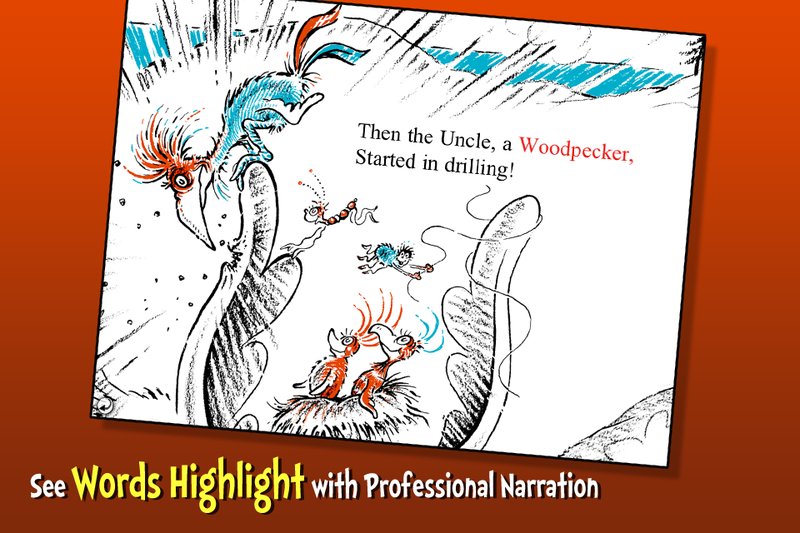 Great narration with highlighting word-by-word reinforces the text and if a child taps on any word, they can hear it spoken again. If you tap on an image in the illustrations, the word will appear with accompanying audio. And as a bonus, if that image is present in the text of the story, the word will highlight again, too. Most Dr. Seuss OmBooks also aren't animated, but many pages begin by panning over Seuss' classic original artwork, zooming in and out to show off each chunk of text in a nicely paced design. Extra features include the ability to record your own narration as well as excellent navigation with a nice visual 'thumbnail' page guide. Ample settings allow adults to set the book up with or without audio and interactive elements. In this Dr. Seuss classic, published in print in 1948, a 'big-hearted' moose named Thidwick proves to be so generous it is nearly his undoing. This is a well-paced rhyming title, although not an early reader. The illustrations in this title, while lovely, have a more 'sketched' quality, with fewer colors & details than the artwork in many of Geisel's older works. The story itself is a bit controversial, with an end that includes shooting small animals and mounting them stuffed on the wall of a gentleman's hunting club. It has been suggested that this title also has political overtones, as an allegory for a country being overrun by ungrateful immigrants. "If you are too generous, you will be taken advantage of" is the clear message in the story, as the animals around Thidwick each make their home in his antlers. The kind moose is at first welcoming, but soon he is nearly crushed beneath their teeming masses. While this is not your usual light-hearted Dr. Seuss book, it is one of his more complex titles, like the Lorax, with a deeper plot and more subtle themes. Recommended. Thidwick, a moose in a herd numbering approximately 60 who subsist mainly on moose-moss and live on the northern shore of Lake Winna-Bango, grants a small bug's request to ride on his antlers free of charge. The bug takes advantage of the moose's kindness and settles in as a permanent resident, inviting various other animals to live on and in the moose's antlers. The moose acquiesces to the unexpected living arraingements, considering the animals 'guests' even though he never told them explicitly that they were allowed to live there, and the situation quickly gets out of control. When one of the guests - a woodpecker - begins drilling holes in Thidwick's horns, the other moose give Thidwick an ultimatum: Get rid of his guests or leave the herd. When Thidwick's sense of proper etiquette directs him to forgo the comforts of herd life in favor of being kind to his guests, his herd leaves him. When winter comes, the herd swims across the lake to find fresh supplies of moose-moss, but when Thidwick attempts to follow them, his guests strenuously object. Even facing starvation, Thidwick refuses to break etiquette, and remains on the cold, northern shore of the lake where his guests prefer to reside. The residents of Thidwick's horns, without regard to the increasing physical or psychological load that the moose has to bear, continue inviting other animals to live with them. The situation comes to a head when hunters attack Thidwick with the goal of mounting his head on the wall of the Harvard Club. Thidwick attempts to outrun the hunters, but the heavy load, coupled with his guests' unwillingness to travel across the lake, prevents his escape. Just before his imminent capture, however, Thidwick remembers that it is time to shed his antlers. He promptly sheds his antlers, makes a snide comment to his former guests, and swims across the lake to rejoin his herd. His former guests are captured by the hunters and are stuffed and mounted with his antlers on the Harvard Club wall.